Happiness Unlimited...: If you dont use it, you lose it !! LML Vespa was my first self owned 2 wheeler, and of course, with something that we own with our first salary of life, it obviously deserves a special place in our lives too, and so it did. I used it for around 7 years across cities like Delhi and Vadodara. I purchased it when i was working with L&T Vadodara and made sure i brought it to Delhi along with me, when i moved. Times changed. The economic liberalisation and a brand by the name "Maruti" revolutionised the Indian car market. I changed with the changing times. There was no looking back at the two wheeler. Though a scooter (or any two wheeler) seems to be more of fun for a newly married couple, Car soon became a necessity with the advent of kids in our family. We had our own Maruti 800 now. Though we switched over to using our car, i could not part with my LML Vespa because of the attachment it very well deserved. First salary, courtship days, first job etc etc...these memories never allowed me to think about selling it off. Not only that, it had served its master so well for the last so many years. But then, as i was not really using my scooter, it started to lose its sheen. Dust started to accumulate. With dust and water came rust. Tyres started to deflate slowly and with continuous lack of air, cracks started to appear after a few years. I still hung on with my memory momento, though i was always short of time to take care of my beloved scooter. One day, there was a big dust storm in our part of the city and probably someone had also tinkered with the scooter stands, the next day i found the scooter lying flat on the ground with its ornaments scattered around. It had fallen off its stands and lying as if someone had shot it down. There were some rusted spare parts and rust crush scattered around. The rear view mirror which i used for staring at my beloved during the long driving hours, lay crashed and broken to pieces. The spunch from a seat crack was bulging out. I knew its days are over now. The very next week, i took it to a mechanic, spent a few thousand bucks, brought it in a working condition and sold it off. Yes, i had to check my emotions, but seeing it dying was more traumatic than seeing it go off !! 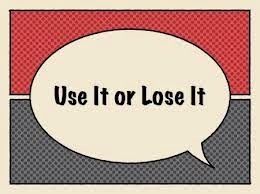 "If you don't use it, you lose it !!" said my wife, and i very well understood what she was trying to say. 15 years down the line, i have come to realise that this is such a universal fact and a powerful phenomenon that you can use to kill something that you always wanted to kill - some of those old stubborn habits which never seem to die off e.g. leaving a cigarette, not getting into the habit of regular walk, eating unhealthy food, leaving anger etc etc... We can use this concept effectively to lose these unwanted habits. I have been using the same concept and making an attempt to lose anger from my life, and remembering this phenomenon has been paying rewarding benefits. Anger has been one of my biggest weakness till date. So, what i do is at the start if the day, i tell myself that today, i am not going to "use" anger..whatever happens. I will use something else instead. I will "use" peace to handle the same life situation. If i don't use anger, i will start to lose it soon. And it becomes easier as i go along losing anger. Using peace (Maruti car) to commute to office (life's journey) instead of anger(scooter) can only make my life happier. I made a placard and kept it with me. I entered it as a repeated reminder in my mobile. I installed it as my computer wallpaper at the desktop. I did all that i needed to, so that i keep reminding myself of the fact that "I must use peace to handle life's situations." The more i used peace, the lesser i used "anger" and slowly i can see that anger is getting rusted, it is getting deflated, and there will be a day when a storm will come and anger will fall off just like the rusted scooter. I know that if i don't use it, i will surely lose it. It may take time, but it is worth the wait.